Venezuela's opposition, non-government organisations and international bodies have accused the government of using military courts against its critics. The courts have detained at least 50 protesters, according to a local human rights organisation. The secretary general of the Organisation of American States (OAS) likened the country to a dictatorship. Government officials have not confirmed the arrests or the military processing of civilian suspects. Meanwhile, official figures show there has been a sharp rise in infant mortality and maternal death rates in the country as its economic crisis continues. "The right and basic guarantees of due process no longer exist in Venezuela from the moment a civilian is forced to appear before a military court," said Luis Almagro, the Uruguayan head of the OAS, in a video statement on Monday. Venezuela announced its withdrawal from the OAS last month, accusing the US-based group of meddling in its affairs. 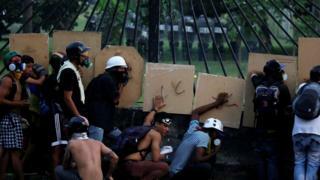 President Nicolás Maduro said on Monday he planned to create a constitutional military assembly to deepen his revolution. He wants to involve the armed forces in his new citizen's assembly, which he says is needed to restore peace as the country deals with daily protests that have claimed more than 30 lives in recent weeks. His critics say the new assembly is being designed to neutralise the opposition-led legislature, the National Assembly. "A regime that has violated the constitution in all of its fundamental principles." The words used by Luis Almagro were strong, but not nearly as strong as those used by anti-government protesters marching in Caracas on Monday. "Dictator, murderer, repressor," is what they called Mr Maduro, as they demonstrated against the president's plan to create a citizens' assembly to draw up a new constitution. "We don't need a new constitution, we need a new president," one woman said as her fellow demonstrators cheered. At a rival pro-government march, a speaker meanwhile tried to whip up enthusiasm for the citizens' assembly. Waving a copy of the constitution, he asked the crowd to "give a cheer" for articles 347 and 348, which give the Venezuelan people the power to change the constitution. The response was muted. Asked about the proposed changes, many struggled to explain why the constitution introduced under their beloved late leader, Hugo Chavez, needed changing. The National Assembly is meeting on Tuesday, alongside various non-government organisations, to discuss what they see as serious government repression. Citizen's meetings, arranged by the opposition groups, are also taking place across the country to discuss the proposed constitutional amendments. Alfredo Romero, a lawyer for Foro Penal, told AFP news agency military hearings involving civilians had been taking place for several days. "So far, 75 people have been brought before Venezuelan military courts," he said. "Fifty of those remain in custody." Foro Penal said they were being held in Guarico state, south of Caracas. In the first figures released since the start of Venezuela's economic crisis, which is fuelling opposition to the government, the health ministry said women dying in childbirth or within a month of giving birth had risen by 65%, while child deaths had climbed 30%. There has also been an increase in cases of illnesses such as malaria and diphtheria, which had been eradicated. Venezuela's acute shortage of almost all medicines has driven thousands to cross the country's borders in search of the drugs they need, while many doctors have emigrated, saying hospitals lack basic equipment. The opposition blames the crisis on economic mismanagement by President Maduro, but he says medicines are being hoarded to encourage a coup against him.